What Thailand, Indonesia, and other Southeast Asian countries can teach Japan about dealing with disaster. Compared to most of its Asian neighbors, Japan seems like a very different society. Unlike in Bangkok or Rangoon or Jakarta, schedules run on time in Japanese cities, and essential services, from street cleaning to tax collection, work effectively. Though it slipped this year from the second largest to the third largest economy in the world, Japan remains, on a per capita basis, far wealthier than China, and, despite years of economic stagnation, its manufacturing firms remain among the best in the world. And yet, in many ways, the aftermath of Japan’s tsunami resembles the aftermath of the 2004 tsunami, which hit much poorer Asian nations, killing over 200,000 people. It has exposed serious dysfunctions within Japan’s leadership and economic structure; in fact, the Japanese government’s response to the disaster has much in common with the responses more closed governments, like Thailand’s and even Burma’s, had in 2004. Meanwhile the Japanese public, which expected its government to handle relief and reconstruction effectively, has become increasingly desperate. I was in Thailand when the tsunami struck in 2004, and, a year later, I returned to Sri Lanka and Thailand for the first anniversary of the massive wave, to investigate how the region was recovering and what lessons could be learned from the tsunami’s aftermath. Today, some of the most important of these lessons can and should be applied in Japan, as the country works to rebuild its economy and environment—and to prepare better for the next disaster. The first lesson that countries in Southeast Asia learned after the 2004 tsunami was that the environment often proves the best defense against such disasters. Construction along Thai beaches had destroyed natural mangrove forests and coral reefs off the coast. These reefs and forests serve as natural barriers against the tides and, while they could not have stopped the tsunami, they could have provided some protection. They can also help stop coastal erosion, keeping further barriers against the sea in place. Without these natural defenses, however, when the massive wave hit in over-developed places like Phuket, it caused great havoc and damage. How does this lesson apply today? Japan has stricter environmental regulations than a country like Thailand, but it also has a massive, politically powerful construction industry, which has destroyed much of the country’s natural environment. Now, Japanese leaders will need to rein in the industry and combine real reconstruction with efforts to remake the natural environment on the country’s northeastern coast. This will be a challenge for a government deeply invested in the country’s industrial future. A second lesson involves secrecy. In 2004, many governments in Southeast Asia, including Thailand and Burma, were unwilling to reveal, both to the world and to their own citizens, the true scope of the damage. In Burma, a country with more than 1,500 miles of coastline, the ruling military regime prevented foreign journalists from visiting, refused most foreign offers of aid, and, through its state-controlled press, insisted that the damage was minimal. This was surely a lie, and with little real information to go on, Burmese citizens were left without basic data to rely upon, such as where they could find clean water or whether they could leave their land and expect to keep it when they returned. (The Burmese regime repeated such obfuscation after 2008’s Cyclone Nargis, which killed over 130,000 people.) In Thailand, then-Prime Minister Thaksin Shinawatra, an elected autocrat, ordered an investigation into the initial tsunami response, but few Thais believed any culprits would be punished beyond the head of the Meteorological Department (which might have provided a warning), who was merely transferred. Japan is not Burma or Thailand, and, in addition to having a free press, it has allowed in hordes of foreign journalists. But Japanese leaders do have an unsettling history of favoring secrecy over transparency. And already, after the earthquake and tsunami, Japanese leaders have given various, unclear explanations of how far away from the Fukushima nuclear reactors it is actually safe to be, while the heads of the corporation running the reactors have released only minimal information about the scale of radiation being released, whether the reactors have contaminated water in the Pacific Ocean, or how exactly workers are fighting problems at each of the reactors. Meanwhile, Prime Minister Naoto Kan has been virtually invisible: Last Friday, he spoke to the public for the first time in a week. The problem is that such secrecy has curdled popular views of the country’s leadership. “The lack of information has led to growing frustration with Tokyo Electric Power Co., known as Tepco, and the Japanese government, which has parceled out information with little context, few details and giant blind spots,” The Los Angeles Times reported. What’s more, locals in the northeastern coastal area now doubt whether they can believe government information about which foods are safe to eat and not contaminated by radiation, or how they might be compensated for their losses. This frustration could now extend into the reconstruction process, when people might refuse to believe even truthful information from the government. It could also rebound against Prime Minister Naoto Kan, already the fifth prime minister the country has had in seven years. 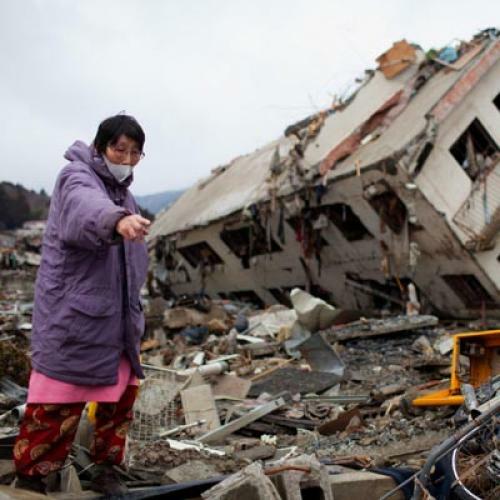 Japan, in other words, would do well look to the 2004 tsunami and learn that secrecy hinders rather than aids recovery. Japan’s bureaucratic tendencies toward centralization and lacking transparency could pose other problems for the reconstruction effort—but there are models from 2004 it could follow to avoid missteps.. In the wake of the previous tsunami, many government officials in Jakarta, Indonesia, accustomed to a strong central government during decades of rule by dictator Suharto, wanted to control reconstruction entirely. But aid workers in Aceh, the United Nations, and some wise government officials developed a different plan. They gave enormous authority to a government body on the ground in Aceh, called the BRR, which was not hindered by as much bureaucratic red tape and could quickly make decisions about how to use relief money. Creating the BRR allowed Indonesia to incorporate local employees of NGOs into the rebuilding process and to empower the Acehnese in their own recovery. Over time, Aceh became a significant success story, with its capital rebuilt and the government using the reconstruction efforts to spark a cease-fire, and then a real peace, with a long-running insurgency in the province. As in Indonesia, the recovery from the tsunami in Japan could provide the opportunity for a kind of reset in Japanese politics—a chance for more creative and decisive leadership. Japan, of course, has no simmering conflicts on the level of Aceh, where thousands of people had been killed in decades of civil strife. But the country is suffering from a milder, though still dangerous, kind of political conflict. After two decades of weak growth and weak leadership, many Japanese are becoming fed up with the nation’s political class, yet they feel like they have nowhere to channel their unhappiness—the politicians in charge have been unable to provide strong leadership in addressing both the earthquake and serious longer-term problems, including an aging society, a lack of immigration, a long-term security challenge from China, and an alliance with the United States unpopular with many younger Japanese. Using the lessons of 2004, Japan should seize the moment and provide a way forward. Most important, the country’s political and business leaders should recognize that, in a first-world democracy, they cannot continually escape public accountability for their actions (or inactions). Although the Japanese public has typically been deferential to authority, after the earthquake and tsunami, that is already starting to change. Online news outlets in particular have blasted TEPCO and the government—and it would serve the country well if the mainstream media joined in, pushing leaders to bear their responsibilities. Compared to the countries hit by the 2004 tsunami, Japan is far wealthier, more organized, and technically better equipped to deal with disaster. Yet there is still much the country can learn from its neighbors’ successes and mistakes. If Japan doesn’t embrace industry regulations, transparency, and a new way of thinking about governance, it will lose a moment of opportunity to build a better future—and, possibly, prevent the next major disaster. Joshua Kurlantzick is a special correspondent for The New Republic.